The GOP’s Merrick Garland blockade is worse for democracy than Trump’s “rigged” talk. The GOP’s Merrick Garland blockade is more disastrous for democracy than anything Donald Trump will do after Election Day. 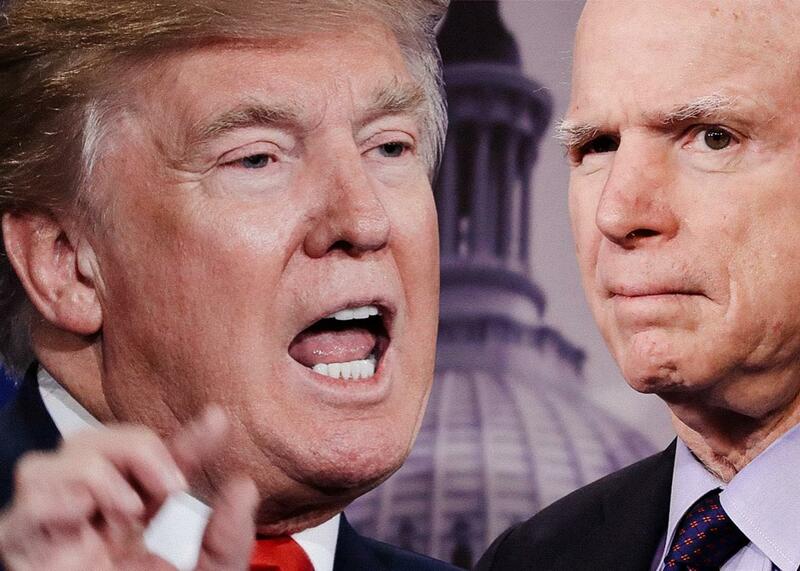 Donald Trump, left, and John McCain. During Wednesday night’s final presidential debate, Donald Trump went further than he had before with his claims that the election may be rigged, refusing to state whether he’d accept the legitimacy of the outcome. On Thursday, he clarified that he will accept the results if he wins. This temporizing appears to have alarmed a number of Republican senators, including Jeff Flake, Lindsey Graham, John McCain, Rob Portman, Ron Johnson, and Kelly Ayotte. Apparently eager to distance themselves from Trump’s rhetoric, these senators have suggested that Trump’s behavior threatens democratic values. They should save their breaths. Nothing Trump says or does on Nov. 9 will be nearly as damaging to American democracy as their vile, cowardly, opportunistic, grotesquely selfish ploy to block President Obama’s Supreme Court nominee, Merrick Garland. Recall, for a moment, the Garland fiasco—a slow-burning constitutional crisis in which we are still mired. When Justice Antonin Scalia died, Senate Republicans decided, for the very first time in history, to hold no hearings for Obama’s nominee, whomever it may be. They even promised to maintain this blockade if Obama nominated a Republican. These senators did not insist on voting against the nominee; they refused to even consider him, before Obama announced who he actually was. They initially alleged that they were eager to let the American people pick the president who would fill Scalia’s vacancy via the presidential election. But when Trump seized the Republican nomination and Hillary Clinton appeared to be the likely winner, some Republicans changed their tune, instead urging lame-duck hearings for Garland. That revealed their actual stance: The American people should decide who appoints the next Supreme Court justice—unless the American people elect Clinton. (McCain has even suggested that Republicans would block any of Clinton’s nominees, though he quickly walked that back.) Now here we are, 218 days after Garland’s nomination, still struggling with a court of eight justices and no tie-breaking vote. It is difficult to overstate the violence that this blockade has done to truly fundamental norms of American democracy. Yes, GOP senators are treating the judiciary like a mere scullion of the ruling party, which itself inflicts grave structural harm to the third branch. But the injury to America’s constitutional design goes far deeper. Republicans are not simply holding open a spot on the court because they want to ensure a conservative court long into the future. They are hobbling the current court, exploiting their own confirmation powers to freeze it in a stalemate, for the very specific purpose of influencing the outcome of decisions. On cases involving religious liberty, free speech, executive power, and immigration, Republican senators know that the next appointee will tip the scales one way or the other. And so they refuse to even consider Obama’s choice, preferring instead to immobilize the court, to leave crucial areas of the law in disarray—in effect, to make decisions for the court by ensuring that, in the most important cases, the justices make no decision at all. This scheme is intolerable to our Constitution and our democracy, both of which are premised on a robust separation of powers and a strong, independent judiciary. James Madison warned against the legislature’s habit of “drawing all power into its impetuous vortex” at the expense of the courts. Just last term, Chief Justice John Roberts quoted Madison while cautioning against a Congress that would use its brute force to turn constitutional boundaries between the branches into mere “parchment barriers.” American democracy functions on the premise that each branch of government will exercise the power afforded to it; today, one branch is actively paralyzing another out of fear that the judiciary might exercise its valid powers in a way that Congress dislikes. That is a horrifying abridgement of judicial independence, a purely political power grab that strikes at the heart of our constitutional structure. And what might Trump do to American democracy if he alleged that the election was rigged on Nov. 9? Fairly little. Yes, he would set an awful precedent; yes, he might encourage his angriest supporters to lash out; yes, he might, to a portion of the country, cast a pall over the legitimacy of Clinton’s presidency. There may be ferocious protests and even dreadful flashes of violence. Both those will be temporary and contained. And the Constitution would survive largely unscathed, having lit the way for an election that, however flawed, delivered a clear victor and allowed for a smooth transition of power. We cannot say the same of the Garland blockade. No matter how this standoff ends, our country will be permanently diminished by it. There is no going back after this. Congress has proved that it can hobble the court and alter its decisions; a taste of that power will surely prove addictive. The barrier between the branches has been breached and will not be repaired any time soon. McCain and his cohorts can complain all they want about Trump, but they are the authors of our true constitutional crisis, the consequences of which will soon fall at their feet. Trump may have damaged our norms, values, and tradition. But the threat he poses pales in comparison with a political party that now values short-term political interests over the very survival of our constitutional democracy.